Analytical Software for Intelligence Led Policing! Brought to you by Enterpol and BAIR Analytics Huber & Associates and BAIR Analytics have partnered to offer Enterpol customers new technology for smarter policing. Huber & Associates and BAIR share a mission to help the law enforcement community manage their information and perform meaningful analysis using quality software. Through this strategic partnership, Huber & Associates has made BAIR Analytics’ suite of products, described below, available to all Enterpol customers. RAIDS Online – RAIDS (Regional Analysis and Information Data Sharing) Online works with Enterpol RMS to allow law enforcement to share crime data with the public through an easy-to-use online crime map and analytics dashboard. ATTENTION – the Enterpol Community can benefit from the BAIR RAIDS Online application immediately with NO additional interface development fees (small annual maintenance fee applies)! ATACRAIDS – ATACRAIDS (ATAC Regional Analysis and Information Data Sharing) is an easy-to-use, secure online dashboard that enables national crime data sharing, pattern analysis, crime mapping and reporting for everyone in your department. 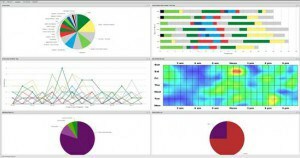 ATAC Workstation – ATAC (Automated Tactical Analysis of Crime) Workstation provides powerful crime pattern analysis, predictive analytics, crime mapping and reporting to crime investigations and intelligence analysis. About BAIR Analytics BAIR (Behavioral Analysis & Intelligence Resources) is an analytical software and service company dedicated to providing public safety, national security and defense entities the innovative tools and subject-matter expertise needed to identify, analyze and resolve problems created by the actions of offenders and their networks that threaten our citizens, our communities and our nation. BAIR’s analytical software and services provide the tools needed to assist in collaborating and analyzing real-time data in order to strengthen your agency’s Intelligence Led Policing efforts. BAIR has extensive experience solving border and drug-related issues through its work with ATF, Mesa AZ East Valley Fusion Center, El Paso, Los Angeles and San Diego County Sheriff’s Department as well as other regional data sharing systems like DDEX/LiNX. BAIR’s tools have been used by law enforcement and defense for more than 20 years in controlling, reducing and preventing criminal activity including counter-narcotics, counter-IED and counter-insurgency related events. BAIR Analytics was introduced to Huber & Associates by mutual client. The popularity of this union has quickly spread throughout the Enterpol Community with agencies already jumping on board! Intelligence technology in policing has taken a new turn and we are thrilled to have the opportunity to share it with you. Please don’t hesitate to contact us for more information or if you would like to be a part of the FREE RAIDS Online offering. To learn more about this or to start a free trial fill out the form below and we will be in touch! Please note, if you plan to attend more than one program you need to register separately for each one.